Login with your Steam account to access your personal Collection and Progress. 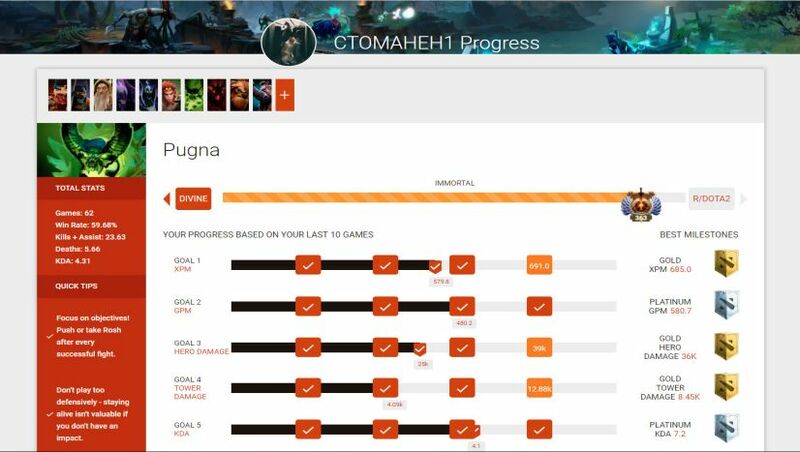 The PROGRESS page tracks your statistical performance in all your ranked games. It visualizes in which areas you are doing great, and where you need to work to become a better player! The TOP BAR displays your current rank. In the example above, our friend CTOMAHEH1 is an IMMORTAL player, 363rd place on the EU Leaderboards. The PROGRESS BARS display your performance based on your last 10 ranked games with the hero. Each of the bars has 4 milestones that you can unlock. In this case, the player has unlocked all GOLD milestones and even two PLATINUM ones, which are very hard to get. The SIDE PANEL displays your TOTAL STATS with the chosen hero (in this case Pugna) as well as some QUICK TIPS based on your performance. Above, the system has picked up that CTOMAHEH1’s lowest stat compared to other Pugna players is his TOWER DAMAGE. To help him improve, it provides some easy to use tips. Below the PROGRESS BARS (not visible on the screenshot), there is more detailed advice on your most problematic stat crafted by pro players. The COLLECTION page is where you can store your favorite guides! This way you will be able to find them instantly! MY GUIDES, where you can find all the guides that you’ve added from the LIBRARY page chronologically. 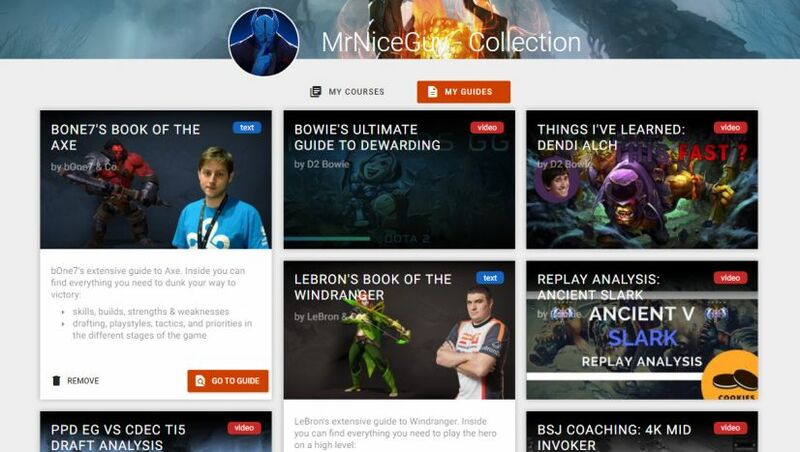 In this case, the last guide that MrNiceGuy was using was bOne7’s Book of the Axe. MY COURSES, where you can find the courses you’ve added from the COURSES page. When you open your COLLECTION page for the first time, you’ll find a small present from us: three of our premium pro player guides! Qojqva’s Book of the QoP, LeBron’s Book of Lion, and Nikobaby’s Book of Luna!